Clock dividers... Rotating clock divider or QCD? Do I want to use HP for expanders? What about Octocontroller in comparison??? What am I missing? What should I ditch? What did I forget? 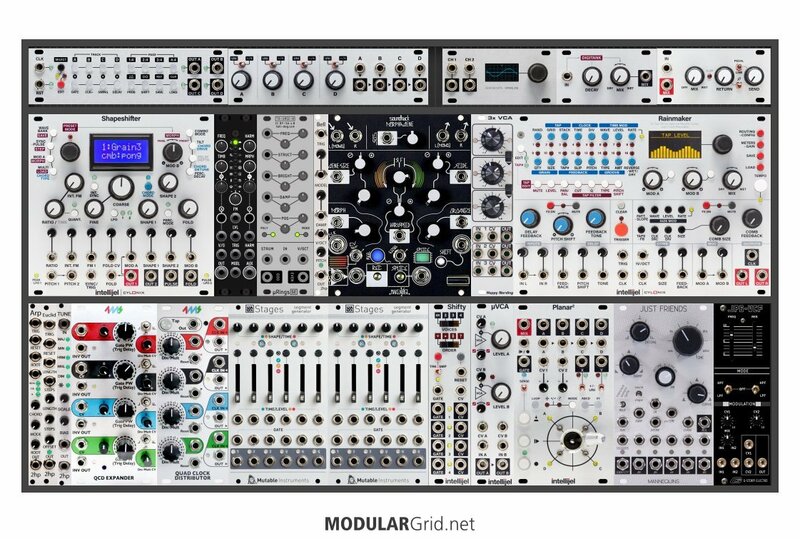 Give me the modular gods interwebs wisdom from afar! Nah, keep the Plaits...you've got it plus the Shapeshifter in this cab, and that gives you loads of digital sourcing. QCD + expander, definitely...loads of timing control potential with that. As for the Doepfer A-106-1, here's a sick and twisted idea: use its resonance insert, put the Chronoblob in it. Then take the Chronoblob's feedback insert and drop something in THAT...filter, some other processor, etc. That's what's fun about that thing, aside of the MS-20-type filter architecture. You could even set up feedback loops going back and forth from the Doepfer to the Chronoblob, and back again. Plenty of ambient drone/texture possibilities there. Delay...here's an idea, albeit a bit spendy: Verbos's Multi-delay. Note the presence of envelope followers on each delay tap, which opens up a lot of strange amplitude-control possibilities elsewhere in the rig. And tap 8 has the reverb/octave shift on it, which has "ambient" written all over it. Same size as the Magneto, too. Smart move with the Stages, btw...two is very much better than one there! @Lugia Thanks for your response both now and in the past. You have such great insights and offer them to so many in this community... Cheers!!! I've been pushing modules around for about a week and I think I have things somewhat firmed up on that second rack. I'd love to hear any final thoughts on what I pulled together... Anything missing? Any module have a better alternative? Am I redundant or off base anywhere? There are so many variables and multiple ways to do things with devices that it's sometimes hard to see the forest for the trees. With 10+ voices in these two cases I thought Planar2 made a lot of sense for interesting shifts. I figured the stages could be used for envelopes for voices and/or step sequencing, not to mention the 1U steppy. I've really been feeling like I need to multi-track record lately... I only have the Doepfer A-138s mixer in the first case + a 2HP 4 channel mixer... I'm really not liking mixing down two or more voices into one w/ the 2HP and then feeding that into the Doepfer A-138s... And then I only have 3 more voices... It all gets a bit muddled / complicated feeling... And when I'm listening to recorded stereo tracks I keep wanting to be able to control volume on individual voices or throw on a plugin or two individually... I've ordered some 1/8" to 1/4" shielded mono patch cables. I'm planning on running voices directly into my audio interface so at least I can get 8 distinct tracks @ 96kHz / 24bit. Anyway, thanks for any insights or thoughts! 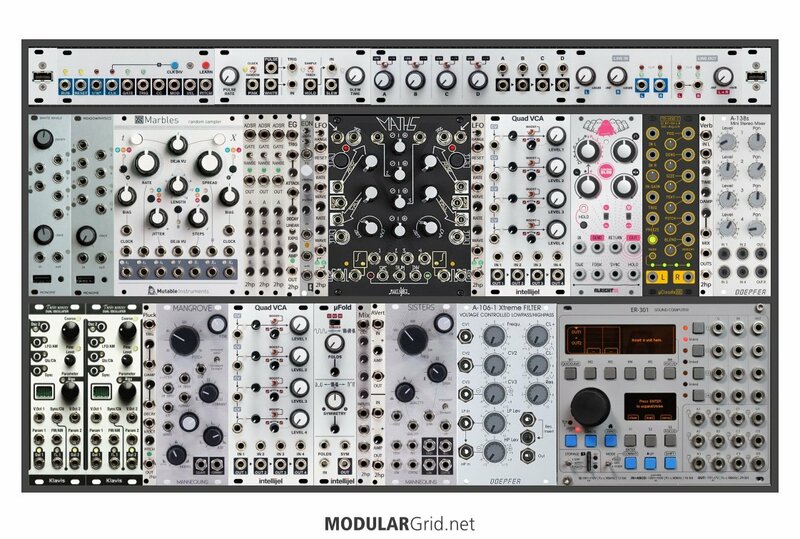 Looking again... Should I sacrifice maybe the Shifty & 2hp modules (Arp, Euclid + Tune) for another Intellijel quad VCA? Actually, I think you could get away with dropping the RCD and RCD Expander, since the QCD + Expander deals with much of the same functionality. You get the rotating division thing with the RCD, but you could likely find a way to emulate that behavior some other way. Better idea: lose the Shifty and the Jove VCF. Replace the Jove with G-Storm's 8 hp version of the Jupiter-6 filter (which I definitely endorse the use of, given that I've got an actual JP-6), then you'll have the 12 hp for the Quad VCA. But the thing that worries me, looking at the above, is that the build currently has NO VCAs...and that's just not going to work out nicely. So what I would suggest is to grab two different 6 hp VCAs: the Happy Nerding 3x VCA (linear - for CV/modulation work + mixing) and an Intellijel uVCA II (dual VCA, adjustable for either linear or exponential [audio] response, plus 2 channels of mixing). That gives you five VCAs and two mixers in one shot. Keep the 2hp modules...I think you're apt to find them rather useful. @Lugia I love that G-Storm Jupiter-6 filter, sounds amazing from the demos. And that Happy Nerding 3x VCA looks awesome... Never knew that was even a thing! G-Storm's replications are top-notch, IMHO. I'm quite familiar with the sound of both the Jupiter-6 VCF (mine is sitting about 5 feet to my left) and the ARP 4012 VCF from the original ARP 2600 versions (loads of experience with those), and they pretty much nail the sound of the originals while adding a few extra bonuses such as dual inputs and much smaller sizes than quite a few of the other replications. Noting that you had the Jove in there was a big key in opting for that change, freeing up that extra chunk of space.